The Sierra Norte de Sevilla Unesco Global Geopark is located at the north of the province of Seville, in the mountainous alignments of the western region of Sierra Morena and is one of the largest natural protected areas of Andalusia, with 177,484 ha. 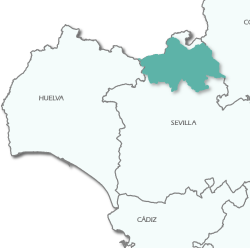 The geopark includes, totally or partially, ten municipalities: Alanís, Almadén de la Plata, Cazalla de la Sierra, Constantina, Guadalcanal, Las Navas de la Concepción, El Pedroso, La Puebla de los Infantes, El Real de la Jara and San Nicolás del Puerto; with a population of 25,250 inhabitants (2018 data). In this place you can consult information about the Sierra Norte de Sevilla Geopark as basic data, natural and cultural heritage, how it is managed, etc., as well as maps, photos and publications related with the natural area. In addition, you can plan your visits, participate in their conservation and discover tools for the sustainable development of the people who live in their environment.